Paddington station (1852-54) became an iconic symbol of the Victorian railway largely on account of its prominent place in William Powell Frith’s vast canvas The Railway Station (1862), which became one of the most popular paintings of its time when exhibited in 1862. Alongside Frith’s representation of a crowd of passengers waiting to board a train is Paddington’s train shed itself, elevated from an ugly product of industrialization to occupy centre stage in high art, filling almost the entire upper half of the canvas. The oblique viewpoint chosen by Frith, looking diagonally across the train shed, serves to open up the space of the station and to reveal its architectural detail – the painting still probably being the best record of Paddington’s appearance when newly built. Frith himself didn’t paint this part of the canvas, employing another artist, William Scott (1840-1903) – a specialist in architectural subjects – to painstakingly render Paddington’s iron-and-glass interior. This division of labour gives the painting a curiously disjointed appearance, the mass of figures in the bottom half seemingly severed from the upper half by the hard line of Paddington’s longitudinal iron girders, which, due to the oblique perspective, seem to bisect the canvas. In addition, the repetitive ironwork of the train shed, in effect a mass of identical units, contrasts sharply with Frith’s careful composition of the crowd beneath it, which, although at first sight seem to be an undifferentiated mass, is nevertheless ordered in discrete compositional groups and balanced by a strong sense of order. 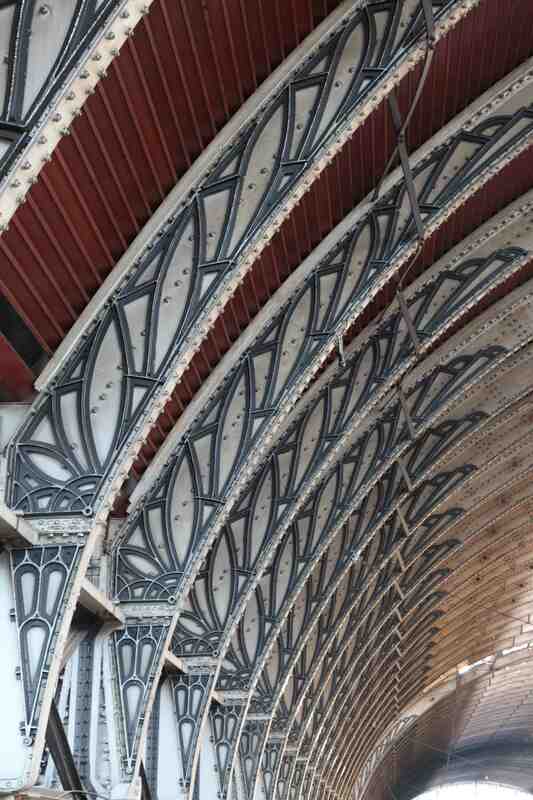 Perhaps, in juxtaposing Paddington’s ironwork with the human drama of the crowd, Frith was attempting to humanize the station’s mass-produced ironwork and its association with mechanical uniformity and the railway’s brutal reordering of the natural rhythms of human life. Wrought-iron arabesques in Paddington’s glazed end-screens. Indeed, it may have been the reassuring effect of Frith’s painting that led to Paddington’s elevated status in the expanding pantheon of metropolitan termini. Barely commented on in the building press when first opened in 1854, The Building News, in an 1868 article on London’s terminal stations, thought that the arrangement of Paddington’s interior ‘gives it intricacy and picturesqueness, and conveys an idea of something approaching comfort.’ This acceptance of Paddington’s radical new aesthetic may have also been a product of the station’s having become, in the intervening years since its opening, an accepted part of everyday urban experience. Indeed, writing only a month after the station opened on 29 May 1854, The Leisure Hour already regarded it, along with London’s other new termini, ‘as much a matter-of-fact affair as a cup of tea’. Yet, in the same article it also pointed to an entirely different kind of perception of the station. Imagining ‘a respectable mandarin of Peking’ (still using pre-industrial methods of transport) suddenly being dropped down into Paddington’s interior, the newspaper wondered at the phantasmagoric effect it would have on him: ‘How he would stare at the flaming gas-lights, at the glittering roof, with its light cross-work of iron bamboo! How the sudden appearance of the monster engine, with its goggle eyes of fire, would bewilder the brains of the chinaman!’ If, for this first-time visitor, Paddington was ‘a dream conjured up by the fumes of opium’, even for the natives who had got used to it the foreigner’s experience was still a mirror of their own when they had first encountered the railways, which after all represented ‘a dream once, and that not very long ago’. 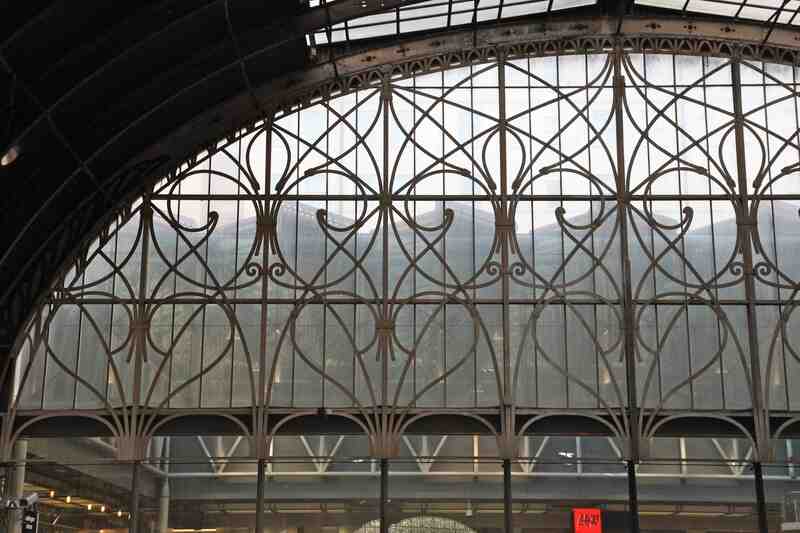 Cast-iron tracery on Paddington’s arched wrought-iron roof ribs. Moreover, as The Leisure Hour went onto state, no matter how much a part of everyday experience, railway stations like Paddington still had the capacity to invoke a dream-like state if viewed in the right way. By breaking from the rush of travel and stopping to contemplate, one might notice ‘the pleasant sunlight shimmering softly through the arching roof … and the glistening rails winding onwards for miles, and converging to a point in the far perspective’. Just as in Frith’s painting the eye is led out from right to left across the canvas and out of the station to the limitless country beyond, so any onlooker in Paddington’s train shed, in the right frame of mind, might once again experience the original dream of the railway. Looking down the central span of Paddington’s train shed in 2011. Spend a lot of my time here but I always enjoy looking at it – such an elegant and atmospheric station which has not lost its 19th century feel altogether. Thanks Diana. 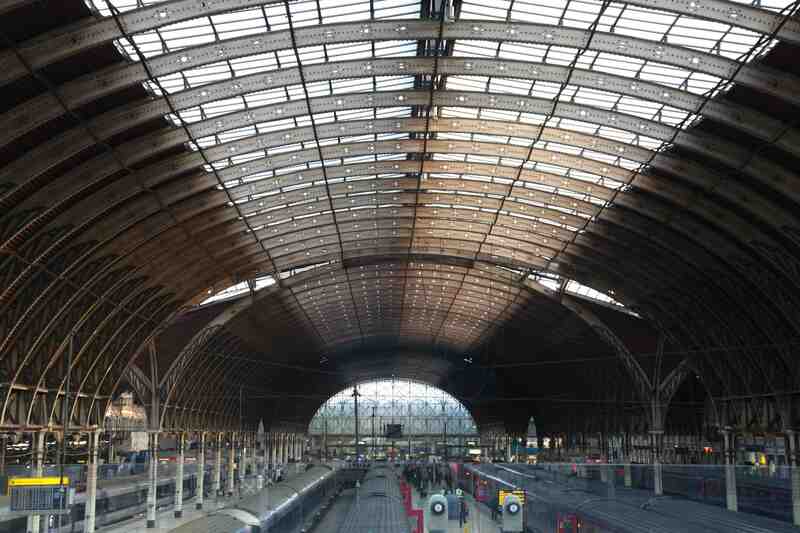 Yes, you’re right – Paddington is one of the best preserved of London’s big stations. The way the light filters in through the roof structure is particularly evocative of the Victorian era I think.